Letters From Ripley: This List of Changes? I sat and read through today the list of gun 'solutions' from this David Hogg-kid from Florida that CNN is all hot to feature and carry his message. There are probably twenty-odd problems with his concept for a solution. 1. The only guns to be home-owned...would be a pistol or shotgun. 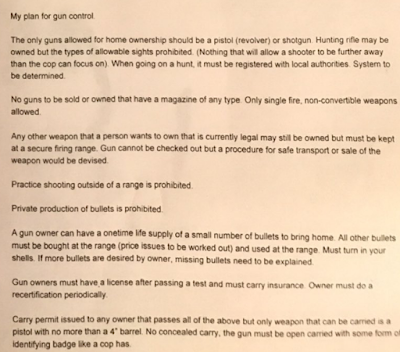 Rifles that fit into the category of hunting weapon, would be allowed to be home-owned, but only with certain weapon-sights. Hunters would laugh over the weapon-sight rule. 2. What happens to all weapons already in the homes? Oddly, he skips that comment. You'd have to go and confiscate them, and that probably won't be something that cops favor. 3. The idea of illegal sights existing? You would see some kind of blackmarket start up and guys buying up dozens to sell later. 4. When going on a hunt, you would have to register with local authorities. Hunting on your own property? He managed to avoid discussing that topic. The fact that you could load the local gaming commission with non-hunter enthusiasts and squash all hunting in an entire region? Well....he didn't bring that up either. Various fees tied to each single request for hunting? Well, he didn't mention that either. 5. "Any other weapon that person wants to own that is currently legal, may still be owned but must be kept at a secure firing range." Well, there are thousands of regions throughout the US which have no secure firing range. Who would manage the firing range? Why are they special? 6. Firing would only be limited to the firing range. This works fine if you live in some urban area. If you live 300 miles west of Tucson...there will be no such range. Who would run these ranges? What federal and state rules would exist? 7. A limited number of bullets to be issued with the purchase of the gun, period. I sat and read over that piece, and kinda wondered how you were going to really enforce this. 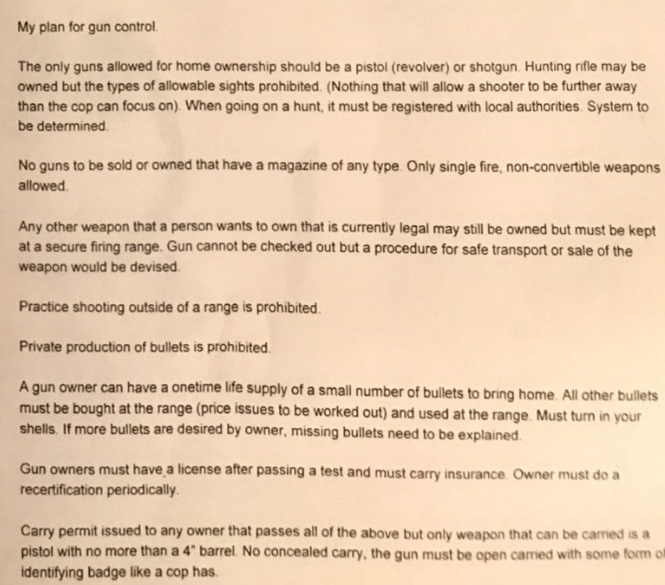 It sounds like you'd have to account for every single bullet and have some county agency monitoring your bullet inventory. 8. No private production of rounds. Right now, I'd take a guess that well over 10,000 individuals across the US are capable of producing their own rounds. They'd laugh at your non-production rule. 9. Gun owners would have to licensed. An interesting concept and some might go along with this. But then the suggestion accompanied the idea of insurance required. What company will handle that? What if they felt it was too risky? Would pistol owners be given a lesser amount of insurance? 10. No concealed carry....simply open-carry. That means you'd walk into your grocery store with this shotgun over your shoulder. I don't see people agreeing to this. 11. The problem of the Constitution....well, yeah. Right off the bat....virtually nothing from this group would easily slide through the Constitution. It was like you totally avoided that subject and pretended it didn't exist. A lot of people back in the 1890s to 1920 era....felt that prohibition would work easily, and they guessed wrong. Convincing folks to accept this type of change that he suggests? No, it just won't happen. I also essay on Germany at Schnitzel Republic. Note, it's purely stories and news on Germany and Europe. "Ripley Lucilio suo salutem", (Ripley greets Lucilius). These are my letters to cover life, death, celebration, politics, events, philosophy, sarcastic commentary, and septic tanks. Inspired by Letters from Seneca (124-essay effort) that brought Stoicism out of the shadows. Stoicism is the concept of accepting pains, woes, sorrows, troubles, luck, gains, losses, and life as being "part of nature". Whatever happened yesterday...simply happened....I can learn from it, gain from it, and then just accept it. No matter what the score was....there is tomorrow and I simply need to put my best foot forward.